I just love helping people to feel confident and express themselves through their clothes. 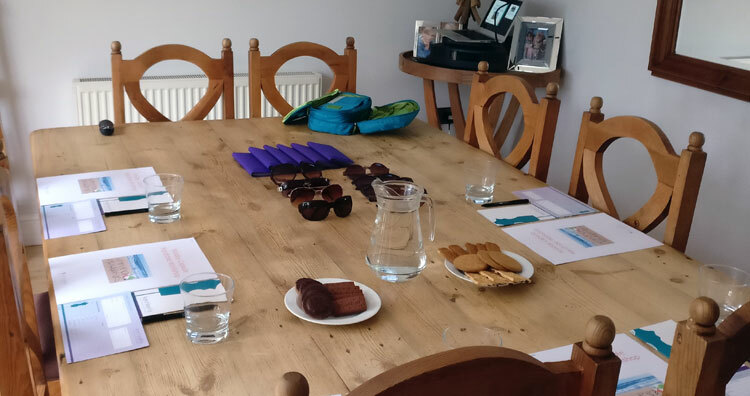 If you’d like to learn all about colours, make-up or style in a fun and relaxed atmosphere with a group of friends or like-minded ladies, a workshop could be just what you’re looking for. The workshops run for two to two-and-a-half-hours at dates throughout the year and take place in Rowledge in Farnham. I can also come to your home if you’d like to get a group of your friends together for a fun ‘girls afternoon or night in’. Colour Workshop – £30 per person (or £25 per person for two or more coming together) – learn which ‘colouring type’ you are and discover your 30 core colours, including both neutral and fashion/accent colours. You’ll receive a handout summarising the season’s trends. (Colour fabric swatch wallets and books available to buy). I generally run 4 or 5 workshops per year. The next workshop is scheduled for Friday 22nd March 12.30-2.30pm. Or if you’d like to get a group of friends together, I can happily run the workshop at your house on a date to suit you. Make-up Workshop – £30 per person (or £25 per person for two or more coming together) – find out how to choose and apply your make-up in this step-by-step workshop. You’ll learn which colouring type you are and which shades of make-up to choose, as well as tips and techniques on how to apply your make-up to suit your face shape. Just get a group of your friends together at a date and time to suit you, and I’ll turn up and lead you all through a fun and informative workshop. Contact me to book. Style Workshop – £30 per person (or £25 per person for two or more coming together) – find out which styles, cuts, fabrics and patterns of clothes suit your shape and proportions in a positive and fun workshop with other ladies. I generally run 4 or 5 workshops per year. The next workshop is scheduled for Friday 29th March 12.30-2.30. Or I can run a workshop specifically for a group of your friends on a date to suit you. Capsule Holiday Wardrobe Workshop – £30 per person (or £25 per person for two or more coming together) – learn how to pack, what to pack (for a 2-3 night to fit into a cabin bag, as well as for a 1-2 week holiday), the best swimwear for your shape, and the most flattering sunglasses, sun hats and accessories. Simply contact me to put your name on the waiting list for my next workshop or to find a date when you and your friends can get together and I’ll come to you! Accessories Workshop – £30 per person (or £25 per person for two or more coming together) – learn how to turn your outfits from ‘drab to fab’ simply by choosing accessories that showcase your style personality, suit your colouring and flatter your shape. We’ll play with everything from scarves, jewellery, hats, bags and shoes. Simply contact me to put your name on the waiting list for my next workshop. Or why not get some friends together and I can come to your house and run a session just for you. Me, Myself & I – Personal Branding Training Course – a powerful, high impact, results-driven programme designed to boost your business by developing your personal brand and image and enhancing your presentation skills. This 1 day workshop will run by Kevin Horlock (Presentations Skills Trainer and Coach) and I and will be tailored to participants to maximise learning. 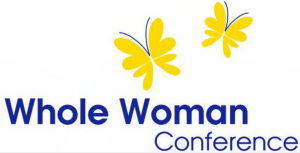 Date: Tbc (April 2019) (the date will be set to accommodate participant availability). Click here for a fuller description of the day and details on how to book. 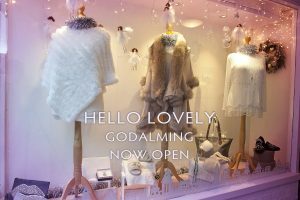 – come and find out which colours and shapes of clothes suit you and see the Hello Lovely collections for this season, plus enjoy a drink and some nibbles. Tickets £10. Contact Anne at Hello Lovely to book: 01483 422221. 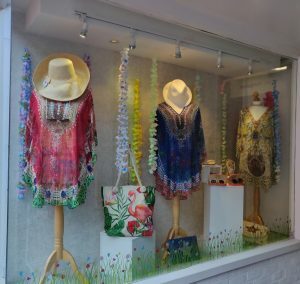 Ladies’ Summer Fashion Evening – 7.00-9.00pm, Thursday 6th June 2019 – The Chocolate Frog, Oakhanger – come and learn about the how to work out and dress your body shape, plus enjoy 10% off your shopping on the night! Bubbly on arrival and a light buffet included. Tickets are £14.95 and are available from Lucy at The Chocolate Frog on 01420 476876 or via email to orders@chocolatefrogcompany.co.uk . Style & Shopping Night Thursday 7th February 7.30-10.00pm. Come and enjoy a night of Style & Shopping at Rowledge Primary School. I’ll be there to give you the heads up on the Spring/Summer’19 fashions and there will be plentiful therapists and stallholders to help your relax and shop! Tickets are £5 – just email me for tickets. 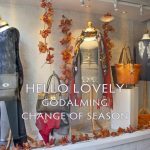 Ladies’ Winter Fashion Evening – 7.00-10.00pm, Thursday 1st November 2018 – The Chocolate Frog, Oakhanger – come and learn how to create your winter capsule wardrobe and how to accessorise your little black (or any other colour!) dress! Glass of prosecco and a light buffet included. Tickets cost £14.95 and are available from Lucy at The Chocolate Frog on 01420 476876 or via email to orders@chocolatefrogcompany.co.uk . New Showroom Launch in Guildford High Street – Thursday 13th September. Come along and enjoy a free mini colour consultation whilst also looking at the new bespoke furniture from Neville Johnson on their showroom launch on Thursday 13th September. I’ll be there 12.00-4.00pm. SOLD OUT Ladies’ Summer Fashion Evening – 7.00-9.00pm, Thursday 21st June 2018 – The Chocolate Frog, Oakhanger – come and learn about the colours and accessories that will give you a spring in your step this summer, plus enjoy 10% off your shopping on the night! Bubbly on arrival and a light buffet included. 01420 476876 or via email to orders@chocolatefrogcompany.co.uk . Sunday 15th October, Warbrook House, Eversley. A whole day celebrating everything that being a woman means – all for a great charity supporting poverty striken girls in Ramana’s Garden, India. I’m one of the workshop facilitators. Read more and buy tickets here. – come and find out your ‘colouring type’ and a few of your colours for this season. Just £10 for 10-15 minutes. Contact Sue at M&Co to book your appointment: 01483 428211. 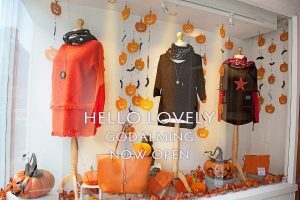 *SOLD OUT* Ladies’ Fashion Evening – 7.00-9.00pm, Thursday 5th October 2017 – The Chocolate Frog, Oakhanger – come and learn about the colours and accessories that will lift your Autumn’17 wardrobe, plus enjoy 20% off your shopping on the night! Bubbly on arrival and a light buffet included. Summer Shopping Celebration at Farnham Potteries (GU10 4SL) – 15th June – 6-10pm Rose Reception & 16th June 9.00-3.00pm. I’ll be there offering Colour and Styling Tasters for just £10. Also there: Travelling Bazaar, Indigo Island, Gilded Cabinet, Libre & Loie and Gem&Tonic. Colour & Style Tasters – Tuesday 13th June 2017 – 3.00 – 5.30pm ‘Wardrobe Upcycling’ event for Move Charity – Kings Farm Barn, Lower Wield. SO24 9RX – shop for nearly new and barely worn ladies’ clothes, accessories and children’s party wear. Plus I’ll be there offering mini colour and style consultations so that you can find out which colours and/or styles suit you best – just £10 for a 10-15 minute consultation. In the mini colour consultation you’ll learn which ‘colouring type’ you are and which colours you can add to your wardrobe this season. In the mini style consultation you’ll pick up top tips and advice on how to dress for your shape and proportions. Simply email me to book your appointment or find out more. Move is a charity that supports children and young people living with cancer through the power of exercise and sport. Colour Taster and Styling Day – 11.00am – 5.00pm Thursday 4th March 2017 – Travelling Bizarre, Farnham – come and find out which colours suit you best at the Summer Style Day at Travelling Bazaar boutique on Downing Street, Farnham. It’s just £10 for a 10-15 minute consultation in which you’ll learn which ‘colouring type’ you are and which colours you can add to y0ur wardrobe this season. Simply email me to book your appointment. Colour Taster Day – 11.45am – 3.00pm Saturday 6th March 2017 – Jigsaw, Farnham – come and find out which colours suit you best at their launch of the Summer Edit at Jigsaw, on West Street, Farnham. It’s just £10 for a 10-15 minute consultation in which you’ll learn which ‘colouring type’ you are and which colours you can add to y0ur wardrobe this season. Simply email me to book your appointment or book an appointment in store. Mother’s Day Colour Taster – 9.30-1.15pm, 25th March 2017 – M&Co Godalming – treat your Mum to a gift that lasts a lifetime – the gift of knowing which colour of clothes suit her. During her 10 minute ‘colour taster’ consultation she’ll learn which ‘colouring type’ she is and which colours she can add to her wardrobe this season. Just £10 per person. Contact Sue or Wendy at M&Co to book your Mum’s appointment: 01483 428211. Colour Taster Evening – 5.30-7.30pm Wednesday 1st February 2017 – M&Co Godalming – come and find out which colours suit you best at this colour taster evening at M&Co, Godalming. It’s just £10 for a 10-15 minute consultation in which you’ll learn which ‘colouring type’ you are and which colours you can add to your wardrobe this season. Contact Sue at M&Co to book your appointment: 01483 428211.